Baby Jesus and the orphans, this was a good show! 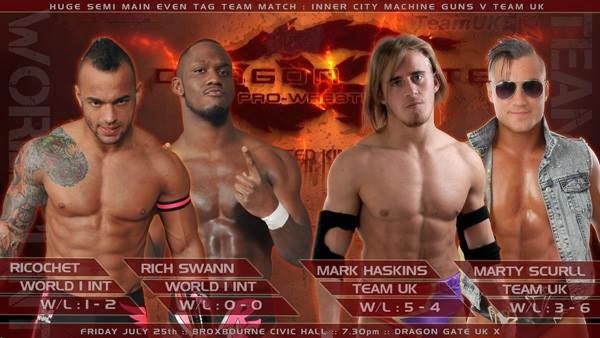 This was my first Dragon Gate UK show, I'd heard rumours that their shows were kind of alright, but I don't think I was ready for just how good this show would be. The only guy on the card I'd seen live previously was Uhaa Nation (and Wild Boar, if you include the pre-show), and whilst I'd heard a lot about everyone on the show, there was only a handful that I'd seen footage of also. It was a very strange feeling going into a show, really not knowing what to expect. So, that's enough wittering, let's take a look at the show. We actually ended up missing the start of this match, which seemed to start very early. Even taking into consideration what we missed (which couldn't have been much longer than two minutes), this was a short match. It did, however, do it's job very well, setting up the kind of hard-hitting and crisp action that would be on the menu for the rest of the evening. This one was all Yoshino, with Hitchman's only real offence being a tasty T-Bone suplex and a running senton. The finish saw Hitchman kick out of Yoshino's Lightning Spiral, before another Spiral got the win for Yoshino. I can't help thinking that this match was supposed to involve someone other than Yoshino, I'd imagine another UK wrestlers to face off against Hitchman, as it did seem strange that 'Yoshino would be working double duty. I expect we could have seen a very different match if this was the case. After a short break, the show proper started with a bang, in the shape of this good, crisp and clean encounter between Akira Tozawa and Will Osprey. With both wrestlers gaining favourable reactions from the crowd (Tozawa was clearly the majorities favourite however), this was a back and forth encounter, with some clever spots, such as a chop battle between the two, leading into a feigned chop by Tozawa, who prompty punched Ospreay in the face. Ospreay looked comfortable in the ring with the much more experienced Tozawa, impressing with his agility and speed, with a stunning moonsault plancha kicking off the night's high flying action perfectly. My only complaint about Ospreay was it didn't feel like he was fully commited to his "turn", in the middle of the match, as he called Tozawa a "pussyole", generating a modicum of heat. I would have like to have seen Ospreay really go for it at this point, as it was clear Tozawa was the favourite amongst most of the crowd. The finish was based around Tozawa's Bridging Delayed German Suplex finishing maneuvre, with the two trading holds as Tozawa attempted to hit move, whilst Ospreay attempted to evade it. Eventually Tozawa hit not one but two Germans to pull out the victory. I would have liked to have seen this match go at little longer, maybe another five minutes, as I think Ospreay and Tozawa had only scratched the surface of what they could do together within the squared circle, however with Tozawa also pulling double duty on the show, it's no real surprise. I think Uhaa Nation could be entertaining against pretty much anyone. 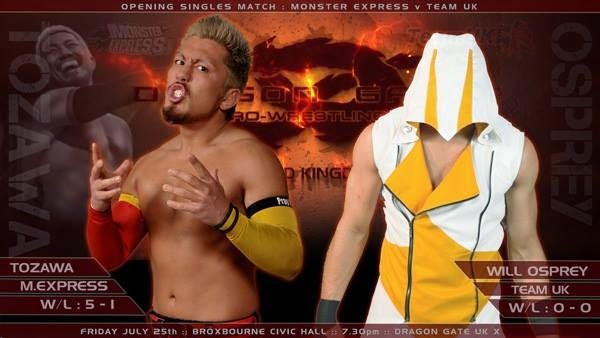 Despite this being his Dragon Gate UK debut, the crowd certainly knew who he was, from his previous forays on the British Wrestling scene and bought the songs along with them. Nation seemed to lap up the attention, wrestling with a big smile on his face as the crowd sang classics like "Uhaa Just A Little Bit" and "Knowing Me, Knowing You...Uhaaaa"
The match felt like it designed to show Nation off to anyone who hadn't seen him before, with Lion Kid spending a lot of the match bumping around for his bigger opponent. This was absolutely fine with me, as the majority of Kid's offence was sloppy and awkward looking. For a guy, who is supposed to be a highflyer, he looked very uncomfortable with a lot of the highflying moves, including a dangerous looking springboard to the outside. Maybe it was just an off night for Lion Kid? Uhaa looked like a star throughout however, with an impressive array of moves demonstrating both his power and agility as he his Uhaa Combination to pick up the quick victory. A man his size should not be able to pull out such a beautiful standing shooting star press like that, should he? If the other two matches had been appetisers, the first half main event was a very satisfying main course. Following on from some solid chain wrestling from Yoshino and CIMA early on, this match escalated quickly into a series of incredible maneuvres and breath-taking near falls that had the crowd eating out of the hands of all four guys in the match. The pace of this one was incredible as it headed towards the finish, so quick in fact, that I stopped even trying to write notes as I didn't want to miss another move! By the finish I'm not sure there was person in the building who wasn't oohing and ahhing with each move and reacting to each near fall as it seemed to be over on a number of occasions. There was a time when someone near by said something to the effect of "This match is never going to end!" with a joyous vivre. By the time the finish came with CIMA hitting his Meteora (Diving Double Knee Drop) finishing move on Yoshino to pick up the victory for his team, the crowd was completely wrapped up in the match, as if nothing else in the world existed. Top, top quality. What stops this match ending up as Match of the Night for me, was the early attempts at psychology that were quickly dropped. Such as Doi & Yoshino working Yokozuka's arm, and Yokozuka and CIMA systematically picking apart Yoshino with a series of submission holds, which made a lot of sense as Yoshino had already wrestled one match in the evening. I think if these things hadn't been included early on, I wouldn't have been too bothered about the lack of any psycology later on, as it hadn't really been what I was expecting anyway, but I think using it early on, to not use it later on in the match felt like a bit of a waste. Either way this was still a superb way to close out the first half. The single best match I've seen live. A pretty much perfect wrestling match, that ticked off all the boxes that I look for when watching a pro wrestling match. It was a simple enough story being told, as Hulk worked YAMATO's arm, whilst Yamato took control of one of Hulk's legs. This made for a very happy reviewer, it helped how precise and crisp both men's offence and selling was as well. I was completely engrossed in this one as soon as YAMATO hit impressive Double Ropehung Dragon Screw Legwhip, before attempting to Irish whip Hulk into the corner, only for Hulk to fall to the ground clutching his leg before making it to the turnbuckle. As the match progressed, the pair became more aggressive, with the pair unleashing a series of stick kicks (YAMATO) and forearms (Hulk) that played nicely into the developing storyline and really got over what this match meant to the characters. The pace certainly picked up at this point, with a lot of fast-paced offence on either side, it did for a time seem like the previous psychology had been forgetten about, but luckily Hulk and YAMATO managed to add the subtlities in their selling that kept those previous injuries in the back of my mind. It all payed off with a tremendous submission sequence, as Hulk locked in an arm bar that made Alberto Del Rio look like Drew Carey. With astounding smoothness, YAMATO transitioned into an Ankle Lock, before Hulk regained momentum as YAMATO attempted to drag him back to the centre of the ring, locking in a Crossface/Armbar combination. As soon as YAMATO had made it to the ropes, both men were up and selling their respective body parts. I'd entered some kind of dreamland, by this point I think, as I neglected to write any more notes! The pair did however launch into a blistering series of stiff strikes and near falls with a Canadian Destroyer thrown in there somewhere for good measure. 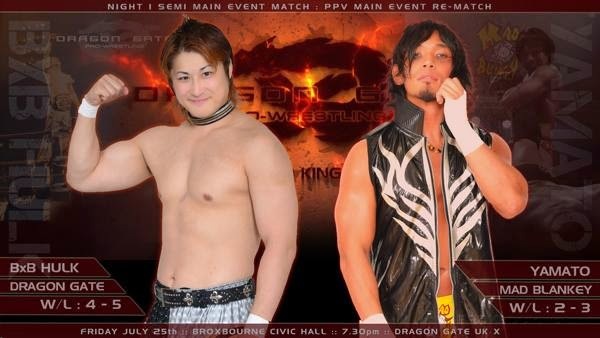 By the time BxB Hulk hit his First Flash Superkick to pick up the victory, there had been thunderous and well deserved "This is Awesome" chants ringing out around the Broxborne Civic Centre. Just a top, top draw match. There are two things that could have made this match better...1. Have it as a rematch for Hulk's Open the Dream Gate Title 2. Have it as the main event of the show. There isn't much more the competitors themselves could've done for me here. 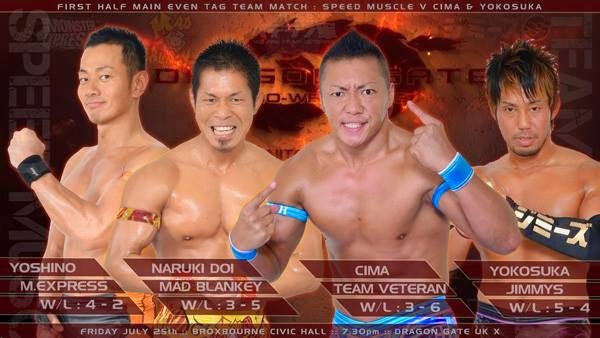 As you may be able to tell by the picture above, this match was not originally scheduled to contain Akira Tozawa. However, after Rich Swann's flight from Canada was cancelled Tozawa stepped in, recieving a tremendous pop from the audience when he walked out as Ricochet's partner for the evening. After the psychology heavy bout before, this was a spot fest, certainly all about the big moves with not much in the way of story telling, minus Haskins working Ricochet's arm for a short period. Luckily, those big moves were fairly impressive and came thick and fast. There were plenty of chances for those at ringside to get landed on, as the four took a number of dives to the outside, including a pair of stereo suicide dives to either side by Team UK and Tozawa's trademark multiple suicide dives, with a superb corkscrew plancha from Ricochet thrown into the mix as well. Marty Scurll seemed to enjoy the quite violent reaction that the crowd had towards him at time (He was probably the only wrestler on the show to garner heat for a sustained time), really playing up to the chants and basking in the attention he was receiving. Despite the heat, Scurll, alongside partner Haskins, was crisp throughout, with a Tornado DDT from Scurll into a Superkick from Haskins on Ricochet being a particular highlight. Not forgetting a silly Double Tombstone Piledriver! This was, most definitely, the best show I have attended live. There wasn't a bad match on the card, with BxB Hulk and YAMATO taking Match of the Night with a near perfect match, that should've main event, a terrific All-Star Tag Match and the main event all delivering far and above my expectations. I would urge any British Wrestling fan who hasn't attended a Dragon Gate UK show to grab yourself some DVDs and book your tickets for next year, as this was a truly World-Class show on British soil.